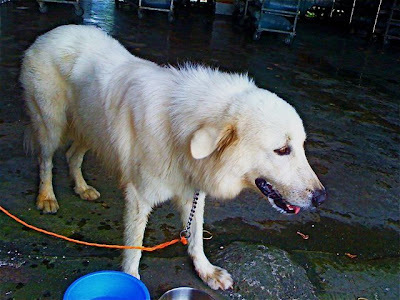 A terrible twist of fate for Mono the Pyrenean Mountain Dog. The owner today called Pa up, and that he wants to give the dog up. And he has only had him for 3-4 days. What has gone wrong? Apparently this fellow has been rehomed at least 3 times already. Each time, the previous owners could not take his antics and misbehavior. And boy... Pa understands he has some. A pyrenean mountain dog is a big fellow. 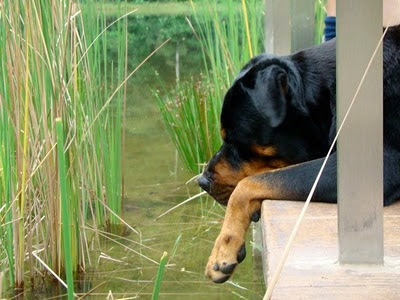 Male dogs can go up to 50-55kgs. This fellow is at least 10kgs underweight. His fur has also been very badly groomed. This is how the fellow should be looking. But the problem isn't only about his looks. His behavior STINKS. He is aggressive and will charge at other dogs. It is HIGHLY possible that he might NEVER go for walks without a muzzle. This was one of those few dogs where going without a muzzle would really be a big bad idea. But Pa as a firm handler, and he had kept him for 1+ day, didn't have the same problems the other more clueless dog owners have. Pa didn't get the same incessant barking that seemed to affect the others. In fact, after a few firm corrections, he also stopped trying to kill Bruno and me. But the bad news still exist EVEN after Pa has offered to train and teach the new owner what to do. Looks like he is going to given away again. Mono is a beautiful trainable dog. And if you have what it takes to train this dog, Pa would be more than happy to give free lessons in order to have him rehomed one last time. Please email Pa at killertouch@hotmail.com. Mono is already microchipped and is looking for a new loving home. It will take a lot of training. Are you up for it? *Preferable for families with no current pets and have Mono their only pet. Hope Mono finds a home soon. Godpa has seen a similar type of dog (Bernese Mountain Dog) being sold at a pet shop. We wonder who bought the puppy and hope the owners are well informed and prepared. I love the picture of him on the porch! So sweet! Great to meet you! Hello friend: I've been visiting your blog and I found "great", with good data. 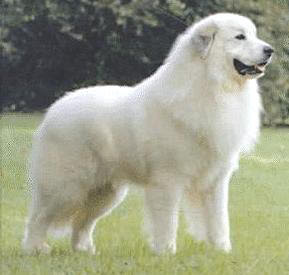 I would like to share with you and your readers more interesting information about the Pyrenean Mountain Dog breed. I hope you like my space "Dogs and Cats" and leave me a comment if you fancy. Fined $9000 for Dog Attack / Farewell to Mono! What Breed is this fellow?